Sahara Weddingrn Cost: 552 crore approxrn The weddings of Subrata Roy’s sons, Sushanto with Richa and Seemanto with Chandini took place in Lucknow in 2004. Sahara chief made sure that there was no dearth of glamour, glitz and style in the weddings. The marriage venue in Lucknow, Sahara Shaher dazzled with torchlights, lamps, marshals, and prism glasses. The sangeet function took place at the Hotel Clarks in Awadh. The wedding venue was the magnificent Sahara auditorium while the entire pre-wedding functions were celebrated at the grand residence of the Sahara’s. less rn Well known and high profile Indians such as Amitabh Bachchan, Mulayam Singh Yadav, Anil Ambani, and Aishwarya Rai were present to welcome the wedding guests. On the auspicious occasion of the wedding of both his sons, Subrata Roy got 101 under privileged girls married. Along with this, food was distributed to close to about one and a half lakh beggars. The wedding was attended by the who’s who of the country. Even the Shiv Sena chief, late Shri Bal Thackeray was present at the event. less rn The wedding cuisine included about a 101 different cuisines from all over the world. Other attractions were the dance performances by Shiamak Davar group and performances by a British Symphony Orchestra who played popular Indian tunes. The seven vows of Indian marriages were inscribed on the pillars of the gateway. The wedding cost was approximately 552 crore.rn Tanwar Weddingrn Cost: 250 crore approxrn Congress Minister Kanwar Singh Tanwar’s son, Lalit’s wedding to Yogita Jaunapuria took place in 2011 in Delhi. Lalit received a Bell 429 helicopter as a gift from his in-laws. A whopping 21 crore was spent only on the tikka ceremony for the groom’s family.rn The guest list included about 15000 people each of whom reportedly received 11,000 rupees as shagun and those who attended the lagan function got a 30 gms silver biscuit, a safari suit and rupees 2100 cash each. The Indian Prime Minister, the king of Bollywood- Shahrukh Khan and all top notch politicians attended the wedding functions. This was a high profile political wedding. 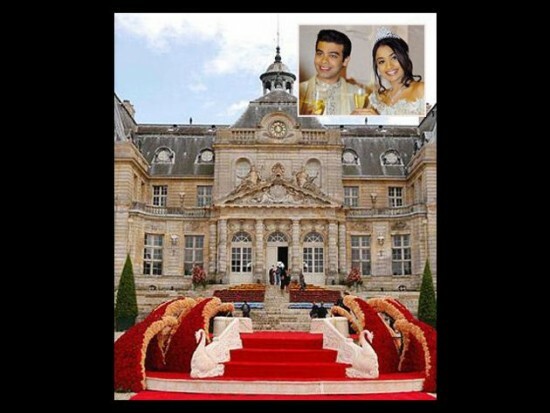 The total amount spent was approximately 250 crore.rn Mittal Weddingrn Cost: 220 crore approxrn Steel magnate Lakshmi Mittal’s daughter Vanisha Mittal’s wedding to Amit Bhatia took place in France in 2004. International pop star Kylie Minogue was also present at the wedding. Bollywood biggies like Shahrukh Khan, Aishwarya Rai, Akshay Kumar, Juhi Chawla, Saif Ali Khan and Rani Mukherjee, all performed at the wedding. The dance sequences were choreographed by Farah Khan.